Although a tropical Laguna seems like a great place to live, not everything is so simple! The people of your tribe have been split apart for many years now. Pirates are patrolling the waters, starving sharks are swimming around, and storms are threatening peaceful villagers and their families. 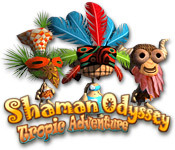 It’s up to you to give your best and help your people to reunite and build a new safe place to live in Shaman Odyssey: Tropic Adventure, an exciting Time Management game.